Slaviero Executive는 과룰류스 국제공항에서 단 8km 거리에 위치해 있으며 우아한 아파트, 실내 수영장과 피트니스 센터를 자랑합니다. 가능한 경우에 한해 무료 공항 셔틀을 이용하실 수 있습니다. 구내 주차장은 추가 요금으로 제공됩니다. Slaviero Executive Guarulhos의 세련된 아파트는 에어컨, 미니바와 케이블 TV를 갖추고 있습니다. 호텔 전역에는 무료 Wi-Fi가 완비되어 있습니다. Slaviero에 머무는 동안 레스토랑에서 세계 각국의 요리를 맛보거나 레스토랑의 다양한 요리를 배달 서비스로 즐겨보십시오. 매일 조식 뷔페도 마련되어 있습니다. Average hotel, nothing special. Close to airport with convenient shuttle. I only stay in Sao Paulo for one day. The airport shuttle is not easy to find. I waited for two hours. It takes 15 mins to the hotel from airport. The room is very clean and big. 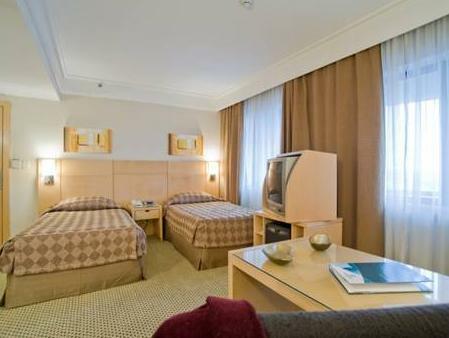 The price is cheap compare with other airport hotels. The staffs are friendly. The airport shuttle needs to wait one hour from airport to hotel. It is not easily to find. It is on the exit D terminal 2, but after that you still need to take serious look on the small blue bus with their hotel mark. Otherwise, you will need to wait another one hour. Internet is fast in both public area and room. we arrived to the hotel after an 11 hour flight. check in was quick. the staff were helpful and tried to answer all of the questions we had. there are a few options for dining out near the hotel, where you don't need to take a taxi. we did try to use the pool as we were there, it was quite small and looked as if it could have used a good cleaning. breakfast was fine. we were only there for roughly 24 hours before we were off to our next flight, so we had a very limited impression. only 1 night stay there, breakfast is quite terrible, room is not too bad, but not value for money. Hotel also provide free internet access. we stayed at this hotel at the first and last day of our trip to brazil because we had early flight the following mornings. when we arrived at the airport we had to wait for the minibus for only a couple of minutes to drive us to the hotel. the room was big and clean. the staff is very helpfull and friendly. i would definitely stay there again in case of early flights. 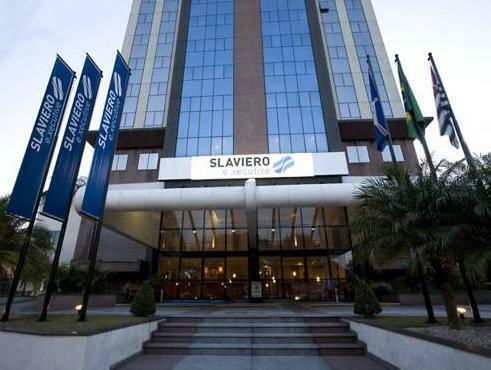 i would not recommend this hotel though if you are visiting sao paulo for several days, cause it's very far from the city (more than an hour) and the taxi will take a lot of money and there's nothing to see and do nearby. I had some difficulites to get the shuttle bus from the airport to the hotel. I did not know in advance that the bus runs only in centain hoours. This information should be clearer. not ideal for somebody who wants to stay in SP longer.the center (for sightseeing, shopping) is far away. great location near the airport allowed us to arrive at the airport within 15 minutes. the shuttle service to/from the airport was very facilitating. 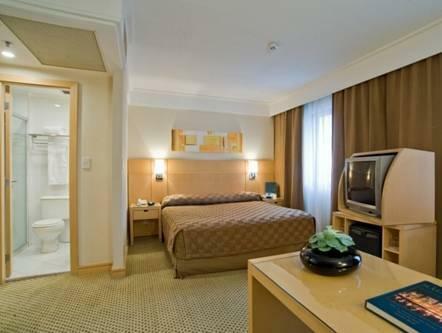 clean room with good amenities. excellent room service. helpful and friendly stuff. internet access and buisiness center available. very good value for money. actually the rate we got from here was excellent, about half of the original price. The airport shuttle service to Guarulhos International Airport leaves once every hour. From the airport it leaves from terminal 1 at the Caesar Hotel shuttle stop at arrivals. Be prepared to wait a while, and to be annoyed by the frequent Caesar and Marriot shuttles. It is free though. When wanting to change euros, I was given the dollar rate, ie 40 % below the going rate. This was further complicated by the staff limited knowledge of english. Need to revalidate (remagnetise) the room key card every day!! Je suis arrivé tardivement depuis l'aéroport. La navette est gratuite. j'ai pris un repas simple. L'état de la chambre et de la salle de bain était ok pour une nuit. Sehr schönes Hotel, mit ausgezeichneten Zimmern, erstklassigem Service, freundliches hilfsbereites Personal, Essen im hoteleigenen Restaurant sehr gut. Bis jetzt immer im IBIS hotel übernachtet. Dieses Hotel ist aber um einiges besser und verdient seine 4 Sterne. Die Zimmer sind super haben eine Couch und Fernseher. Das Bad ist groß und alles ist sehr sauber. Das einzig nicht so tolle ist das Restaurant, da wird gerne mal zuviele auf die Rechnung geschrieben, also aufpassen.Das Frühstück istin Ordnung das Abendessen grauenvoll, wo bekommt man ein zähes Steak in Brasila hier in diesem Hotel. Die Mitarbeiter sind sehr nett außer im Restaurant. Es gibt ein Shuttl zum Airport der nichts kostet. Werde auf jedenfall dort wieder Übernachten aber nichts essen.